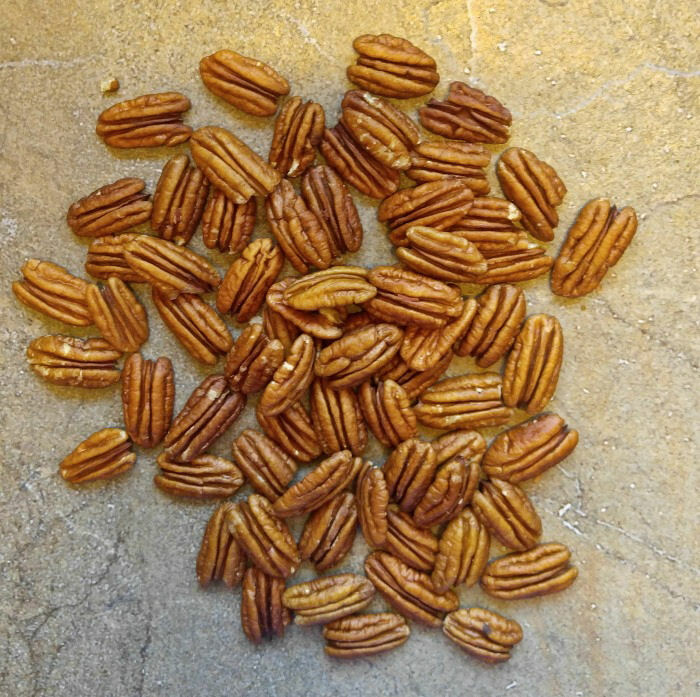 These toasted pecans are coated with maple sugar, cinnamon and nutmeg and cooked on the stove top until they take on a delightful flavor. They make wonderful Paleo and gluten free easy appetizers and are ready very quickly. Pecans are one of those nuts that just seem to tell us that fall has arrived. I use them all the time for breakfast ideas like this pumpkin spice oatmeal recipe and in chocolate brownies. I also love to use them as a part of main dishes, like these apple pecan stuffed pork chops. But today, we are going to be snacking on pecans! 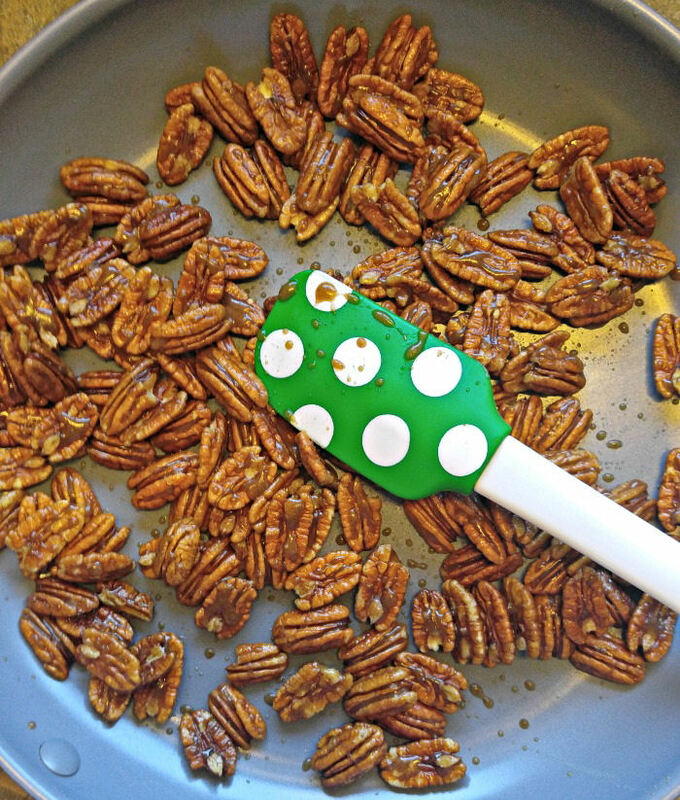 Making Toasted Pecans is Easy. 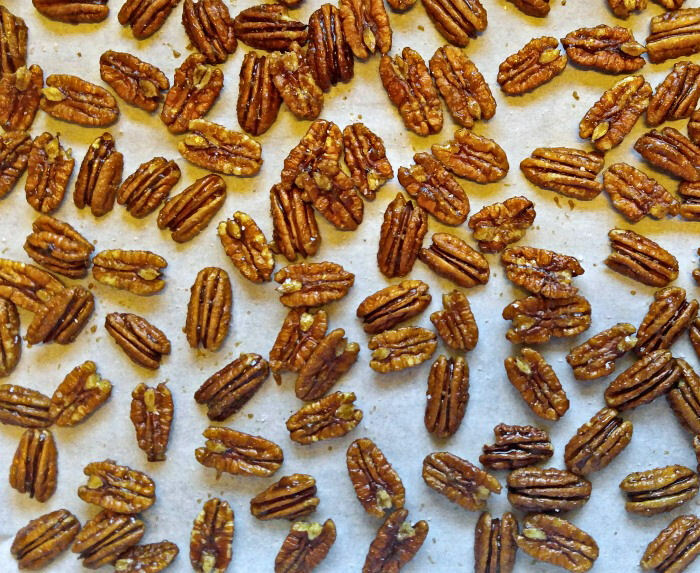 The trick to getting just the right coating on these toasted pecans is patience. If you turn up the heat, you’ll end up with a burnt sticky mess. Start with a very low heat setting to combine the coconut oil and sugar mixture. I used both maple syrup and raw maple sugar. 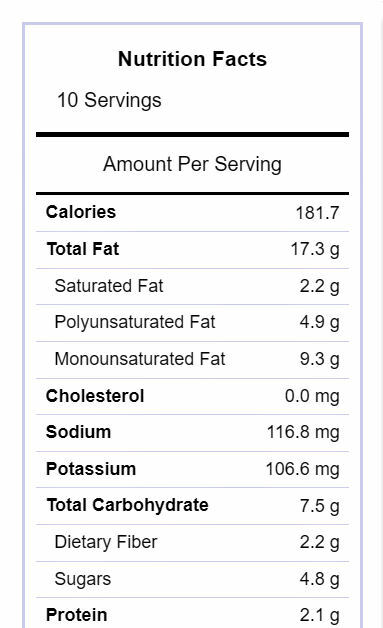 Both have a fairly low glycemic index, so you won’t get a sugar spike like you do with granulated sugar. An added bonus is the amazing taste of the coating! Once you stir in the pecans, you can turn the heat up a little but only to medium! Just keep stirring occasionally for about 7-10 minutes until the sugar mixture has pretty much soaked into the pecans and the whole thing is sticky and rich looking. When you are done toasting the pecans, place them in a single layer on a baking sheet lined with parchment paper and WAIT. An hour. Go do something for a while. They will taste better when they are cool and crisp. 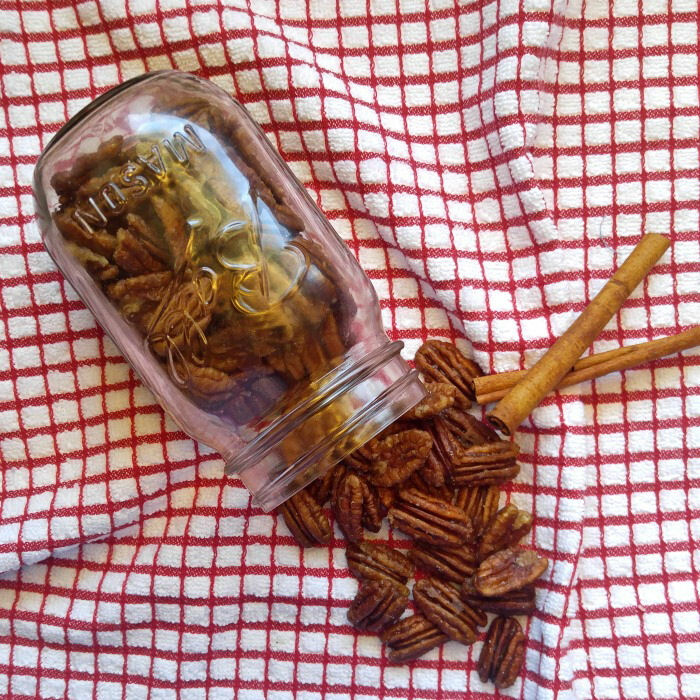 Tasting these toasted pecans is even easier! These skillet toasted pecans are rich and tasty with the delicious coasting of maple sugar,nutmeg and cinnamon. They are so easy to make, you can have a batch on hand all the time. Fall and its cool temperatures tell us that the winter months are coming. I don’t know about you, but I look for cozy, warm comfort foods right about now. When the air is crisp like it is right now, I want to dig into a snack that just screams autumn. And these toasted pecans fit that bill nicely. 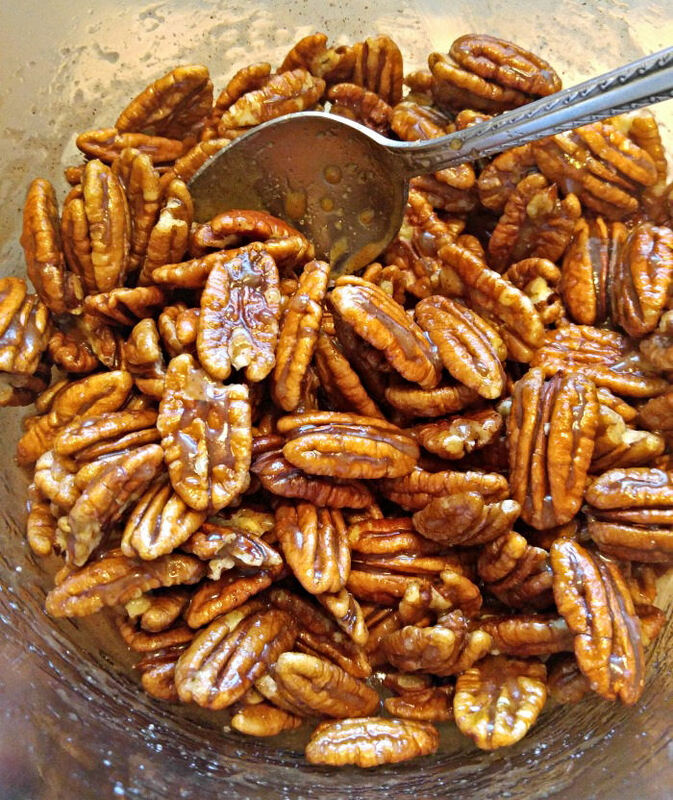 Keep these sugary Toasted Pecans handy for guest to nibble on for your holiday parties. Your guests will just love them, and also love that they fit into a Paleo, Gluten Free, Vegan and Dairy Free Diet plan. These delicious toasted pecans work out to 181 calories for about 20 nuts. Try them soon, you will love the taste! 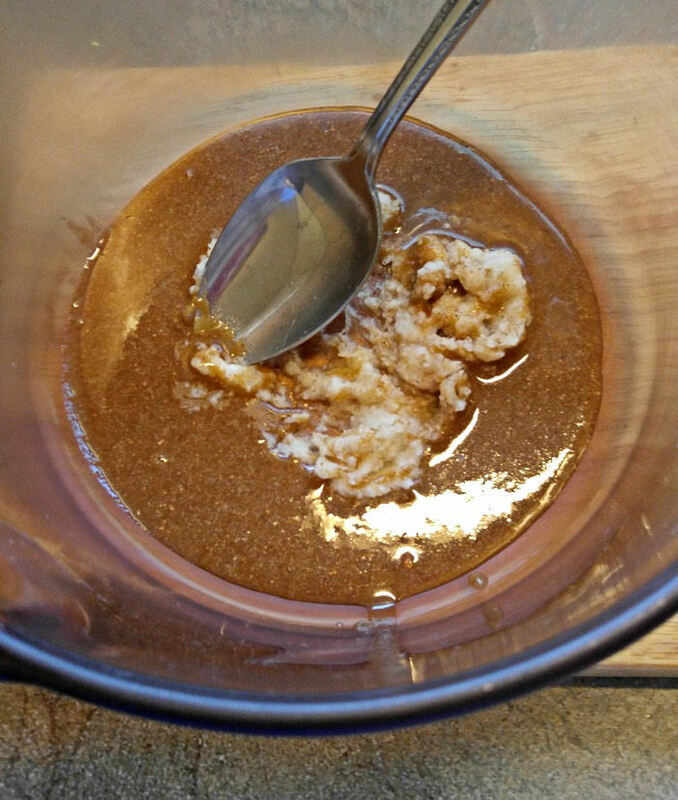 In a small bowl, combine the maple sugar, maple syrup, cinnamon, nutmeg and sea salt. Over medium low heat, add the coconut oil and sugar mixture. Stir until it has melted and is smooth. Add the pecans and increase the heat to medium, stirring until the pecan halves are thoroughly coated. Stir occasionally, and cook for 7-10 minutes allowing pecans to soak in the sugar mixture. Be sure not to let the pecans burn. The mixture will be sticky and most of the sugar will be soaked into the nuts. Pour the pecans onto the prepared baking sheet, in an even layer. If you want the toasted almonds to be a bit more salty, add a sprinkle of sea salt now. Allow to cool for about an hour.